As well as indirect bonding trays and surgical guides. Clinics, labs and practices are championing EnvisionTEC technologies as a convenient chairside solution for both patients and doctors everywhere. EnvisionTEC is a renowned, global leader in professional and industrial resin 3D printing. The company has a full range of SLA printers and premium materials that are developed and valued by dentists, orthodontics and dental labs. iMakr and EnvisionTEC have been partners since 2018. Together, they are ensuring that customers looking for advanced additive manufacturing solutions receive the best products and receive expert support and consultation tailored for each industry. iMakr selected King’s College London Faculty of Dentistry, Oral and Craniofacial Sciences, one of the leading dental research institutions in the world and long-standing iMakr partner, as the obvious place to host the prestigious event. 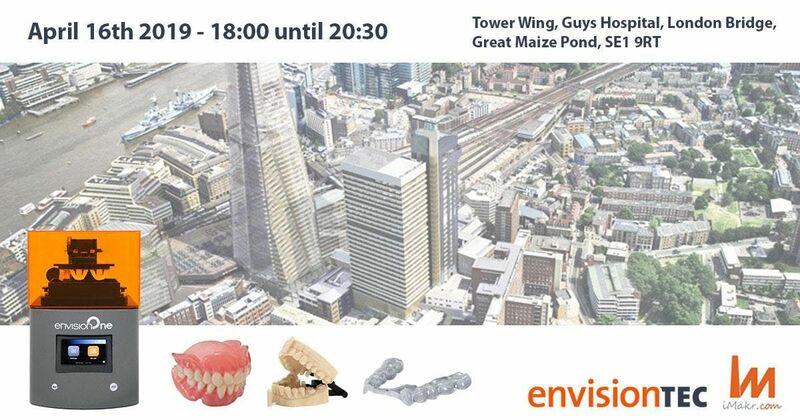 This exclusive event will take place on 16th April 2019 beginning promptly at 6:00 pm in the Tower Wing of Guy’s Hospital. There will be a presentation of the machine and materials followed by a Q&A. Wine and light refreshments will be served. Read more about the Envision One for Dental here.